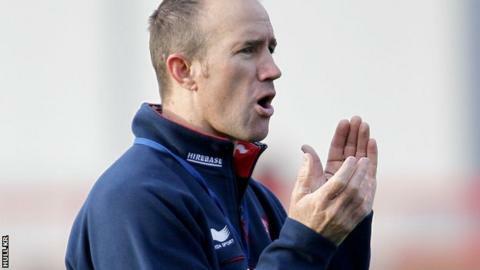 Hull KR chairman Neil Hudgell says that talks with coach Craig Sandercock about a new deal will wait until Easter. Sandercock, who guided the Robins to a 10th-placed finish in his first season in Super League, will be out of contract at the end of this campaign. Hudgell told BBC Radio Humberside: "When we get to Easter we'll sit down and talk about the past 18 months and what the future holds. "We'll get into the meat of the season and see where we're at." Hudgell added: "Craig had a very challenging first year for a number of reasons. "He inherited some very big personalities and then had a lot of injuries to key personnel, but this year he has a run at it with what is essentially his own squad." Sandercock took over from fellow Australian Justin Morgan at the end of the 2011 Super League season. Meanwhile, Hudgell says it is "important" to put a deadline on Tony Larvin's potential investment in the club. The club revealed earlier this month that they were in discussions with the businessman and have now set a date of 31 January for Larvin to prove he has the funds. "The ball is in his court in terms of establishing funding lines and proving them. We think it is important that we have a timeline and we stick to it," he continued.